Does your dog like to go everywhere with you? Do you hate to disappoint him or her when you go for a bicycle ride? You don\'t have to anymore! There is sure to be the perfect bicycle basket for your dog in this collection. The 3-In-1 Bike Basket is a very convenient way to travel with your small pet. The sleek design and .. The Buddy Pet Bicycle Basket - soft and secure for your pet’s comfort and safety. These pet baskets ..
Comfortably lets your pet ride along with you on your bicycle. 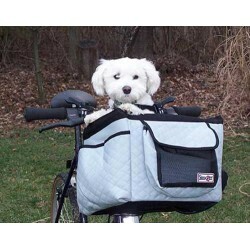 Each seat comes with high visibility ..
Let your Dog Travel in Style when You Bike! This Sporty Pet Bicycle Basket is available in Red/Bla..